Podcasts – What Are They and Why Should You Have one? Going back around 3-4 years, podcasting was seen as an ancient technique, especially with the rise of social media platforms. The public started to veer away from audio content, turning their interest towards up and coming social networks like twitter – you could say podcasts were used in more traditional media. As the saying goes though, ‘what goes around comes back around’. Much like the constant rotation in fashion trends, podcasts seems to have come back into popularity within the past 12 months, especially in the digital industry. In fact, according to research produced by Edison, there were an estimated 39 million people tuning into podcasts in February 2014 in the US alone – that’s a big audience for you to target your marketing towards, so should you be investing in podcasts? When asked about the digital marketing trends of 2015, Marcus Sheridan, founder of The Sales Lion, said “podcasting and audio content will continue to grow at a fast clip in 2015. More and more companies and brands will realize that audio is becoming the preferred means of content for consumers around the world, especially because audio can be consumed in a vehicle”. Taking this into account, podcasting does seem like a viable method of content distribution. Think about the amount of time you spend travelling from A to B, listen to music, or just aimlessly watch YouTube videos with your headphones in. Podcasts can really target these consumers, honing in on these particular habits, and providing them with content to fill the void. So, we have established there is a market for podcasts, but maybe you need more convincing? First of all, podcasts tend to be much longer than the standard blog post, meaning visitors are likely to spend more time on your site, increasing the likelihood of a decreased bounce rate (providing your internal linkage is good). Also, one thing to take note of is the amount of emotion readily available through audio, as opposed to written words. The fact that a podcast producer is able to use actual tone of voice means they can produce much more emotion within their content, and we all know that emotion provokes more engagement. Try it for yourself, I recently wrote a post listing the 5 best digital marketing podcasts; give them a listen and see if it provokes your interest more than just reading a blog post would. Another thing to take into consideration is how easy it is to generate guest content through podcasts. As marketers, guest content is a vital part of a content strategy, however, the vast majority of “influencers” won’t have time to write a full post for you, and they may not really want to. From my experience, it is much easier having a phone call with an influencer and simply ask them some questions. You may find that having a friendly and engaging phone call (where you must create the engagement) can actually seem much more appealing to influencers. Some content writers may be reading this thinking “but what about written content?” I have one word for you – transcripts. As much as I am rambling on about podcasts being the next big thing, you must always have Google in the back of your mind. Audio doesn’t really do much for Google bots or spiders that want to crawl your site for relevant information – as smart as Google is, it doesn’t yet have ears. If it is just an mp3 formatted video you are uploading, you can still optimise meta descriptions, titles, etc. but we all know that isn’t going to produce the best results for your targeted search terms in the SERPs. So how about transcribing the content in your podcast? Depending on the length and structure of your audio content, you can transcribe it into one major blog post, or a few good smaller ones. For example, if you interviewed a top influencer on the trends of 2015, and they mentioned 4 predictions in detail, you have the perfect opportunity to write 4 individual blog posts in a good amount of detail. Voilà, including the original podcast post you now have 5 great pieces of content on your site, 4 of which can be optimised for SEO within the content. Convinced yet? I hope so! So how do you go about setting up a good podcast that will work well for your brand? 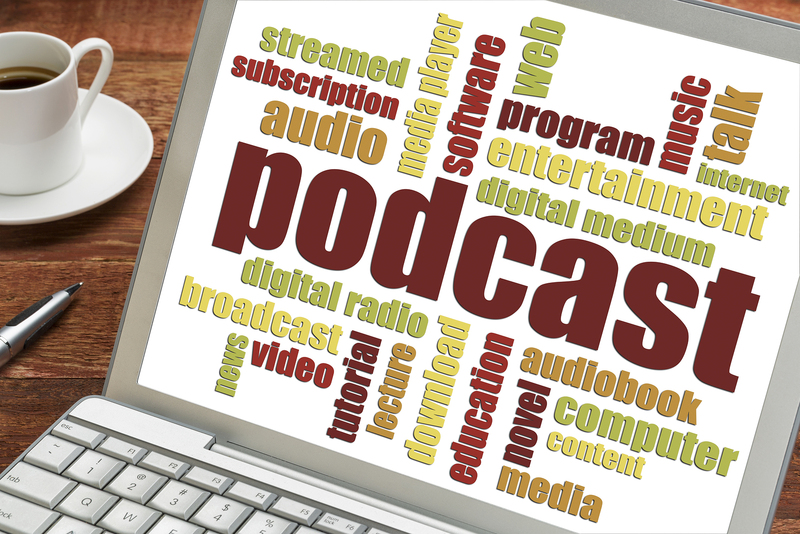 Pat Flynn has written a very detailed guide on how to podcast – ironic right? Nevertheless, it includes extremely good information that is sure to help even the most basic of internet users start up a successful podcast. Make sure you have a set theme for your podcast. You don’t want to go in blind, without any vision of where you want to be. You need to be able to weigh up your knowledge and interest of a particular area, then set the theme accordingly. Also take into account your company’s values and target audience. Try laying out aims and objectives for what you want to achieve through the podcast, and then base the theme, topics and potential guest contributors accordingly. Not having a clear theme can be devastating, but not as devastating as not having a set script. You don’t want to be half way through a podcast and realise you have nothing to talk about, especially if it is live. Scripts shouldn’t be word for word. For one, it would take too much time to write it, and second, it doesn’t leave much room for creativity when reading everything word for word. Just jot down clear topic areas that you wish to cover. This software should allow you to edit the podcast after recording, however, if you wish to purchase more advanced editing equipment, Audacity and Adobe Audition are a good choice. To conclude, mixed solidly with a strong social media strategy and integrated well within all marketing efforts, podcasts can provide the perfect way to drive traffic to your website, while also increasing conversions and time on page for visitors tuning in on your site. It isn’t hard to set up a podcast, so if you are on the lookout for creative and unique ways to push content, give podcasting a go.